I don't usually review "digital-first" books, not because they're not good, there's been a ton of quality books that have emerged from the format - Injustice, DC Bombshells, Legend of Wonder Woman to name a few - it's just that the snippets are so fleeting, ten pages of that whet your appetite but leave you hanging for another week. At 99 cents, it's a great bargain, so I can't really complain. 'Adventures of Supergirl' is special for a few reasons. 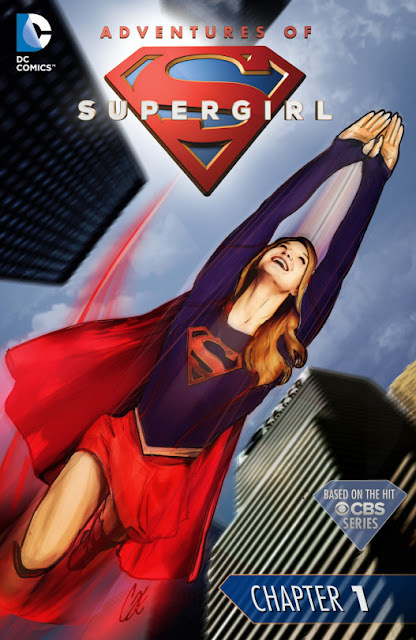 The most obvious and noticeable thing about the comic from the amazing cover by Cat Staggs is that it's based on the hit CBS television series 'Supergirl' starring Melissa Benoist as Kara Danvers. While there wasn't a comic book series in print available when the show debuted, DC Comics has made amends by releasing this series and having veteran 'Supergirl' comic writer Sterling Gates to pen it. If anyone knows this character best it's Gates and it shows. Besides keeping the fun thoughtful tone of the show, Gates adds more personality from Supergirl's inner dialogue and interactions with her sister, Alex.There's a brief and concise origin story recap that will help new readers. Bengal is insanely talented and perfectly suited for 'Supergirl' and his frenetic, expressive, and eye-popping action for 'Batgirl' and the 'All-New Wolverine'proves it. Here, the layouts are creative, well-paced, and the body language expresses so much without a single caption or thought bubble needed. There's a fluid progression from one panel to the next that's bright, vibrant, and kinetic. If you like the 'Supergirl' show you'll love the digital comic even more. It covers some of the same ground but with a new villain clashing with Kara from the start. It jams a lot of action and information for your 99 cents. With Gates' confident voice and Bengal's excellent art, 'Adventures of Supergirl' is off to a roaring start for new and old fans alike.